Travis a 25 year old Chartered Accountant and lives in the Hills District in Sydney with his parents who have no interest in camping or 4WDing !! He does most 4WDing with friends from Scouts and the odd hanger-on here and there. He says more chances to meet up for drives with LCOOLers would be great. 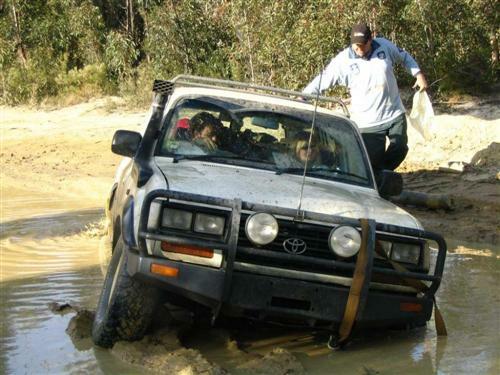 He aspires to have a truck like issue #72 4WD monthly subject, Paul Brennan, who is also a Chartered Accountant. Awesome truck Paul. Travis saw the light, and moved to Toyota for the purchase of his 2nd (current) 4WD. 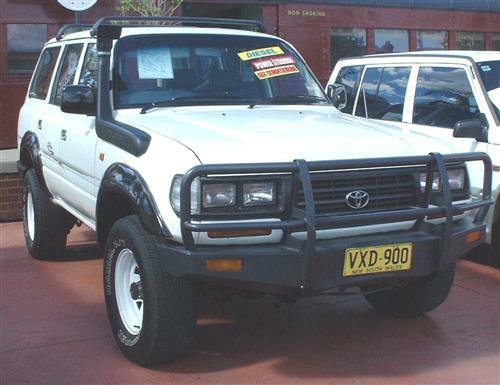 His first 4WD was a 1981 SWB MQ Nissan/Datsun POO-trol, 3.3 Diesel. While this provided a (supposedly) cheap means of getting into 4WDing (Travis was still on his P-plates at the time), the POO-trol only lasted 7 months due to too many repairs, culminating in a blown bottom end which was replaced and the truck sold. After approx. 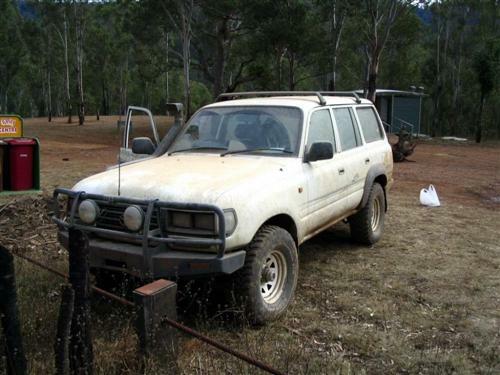 30,000kms in only 7 months, it was a good introduction to 4WD and diesel motor repair costs! Although mostly a weekend and day-trip fun-mobile, the Cruiser has also taken Travis to the awesome Victorian High Country in December 2003 (note for trip pics  my truck is the only one with roof racks (unloaded)), and various other well known 4WD spots including Yalwal, Yerranderie (Mittagong to Oberon), Cabbage Tree Road, Watagans, Newnes and other spots in the Blue Mountains and the odd sand drive at Stockton and Kernel (which is now crap). Menai also used to be a favourite until recently. On-road (sealed/unsealed) touring has included countless weekend camping locations, but also more significant journeys such as north-west NSW (Tamworth-Mt Kaputar-Narrabri-Pilliga scrub-Coonabarabran-Mudgee) June 2004 long-weekend and recently seven days in Victoria over new years 04/05 for the Falls Festival. In the two and a bit years since purchasing the Cruiser in Dec 02, 40,000-odd k's have been clocked up on the odometer, not bad considering it doesnt really get driven during the week. Travis's favourite accessory would be his roof console  many hours were spent on the construction and fine-tuning of this brilliant piece of work by Traviss best mate, Cameron (some may remember him from Vic High Country 03/04). Then add a couple of nights us both trying to fit it, a joint effort. Its roughly 30cm (12 inches) wide and is fitted lengthways in the middle of the ceiling, extending from the windscreen to just behind the front headrests. It neatly and securely holds both the GME TX4200 and 10CD stacker, keeping them both high and dry, it also incorporates the original overhead pod and centre dome light. The timber finish (matching the gear knobs!) looks great and changing CDs or using the UHF has been made very easy.
) has plagued the Cruiser over the last two years. Also various bits and pieces were replaced shortly after purchase also as going off-road for the first time in a few months took its toll on rear suspension bushes, shocks, sway bar mounts and numerous other parts  all wear and tear as basically all parts were original when I bought it  even the spare had never been used. Although during periods of solely driving around town or on-road touring, Toyota reliability kicks in and nothing goes wrong! (Maybe its my off-road driving ability!!?) Thankfully a cheap warranty insurance policy was purchased from the dealer with the car and it has coughed up just over $3,000 towards these repairs! As a result of this the accountant has had to get his hands dirty on the odd occasion and the recent purchase of some better tools (read: any tools) hopefully will assist in keeping Bet you cant! costs down. There is no mods/accessories wish-list for this Cruiser, that will be left to the next owner to contemplate. Travis has plans to travel the world in the next few years and upon his return hopes to find a fine example of a 1HD-FT 80 Series (or maybe 100 Series by that time) to turn into the ultimate toy and tourer. All due to pushing it TOO FAR!! High country new years 03/04. 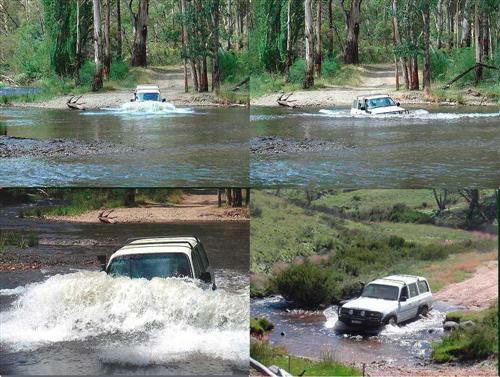 Awesome, DEEP, Wongungarra river crossing plus Davies plain(??). Dazza might remember the tone over the radio halfway through this crossing.